I've been doing several wildlife caricatures which I soon intend to sell as prints. 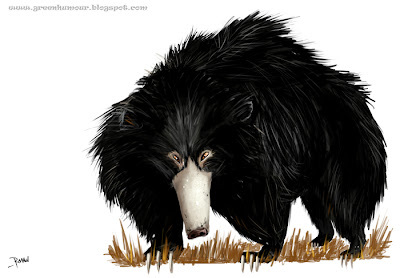 Here's one of these- the Sloth Bear. The Sloth Bear, also called the labiated bear is the commonest bear species of the Indian subcontinent and is remarkable in having feeding adaptations similar to those of insectivorous animals, which are believed to have developed as a result of convergent evolution. Their preferred food consists of honey, termites and fruits. Listed as vulnerable by the IUCN, sloth bears face numerous conservation threats such as deforestation and habitat loss, poaching for meat, claws and baculum, and capturing as performing pets.